A couple of months ago when my almost 3 year old took a sweet potato out of the cupboard and pretended to shoot me with it, I was appalled. "What does this mean!?" I wondered. Where did he learn this? We don't allow toy guns in the house, and we monitor what he's allowed to watch on TV, so I assume he picked up up from the kids at daycare. I immediately turned to our local mom Facebook group to ask if this was "normal" behavior and all of the mom's who commented assured me that it was. They told me that all kids play pretend, and that I had nothing to be worried about. As the weeks went on, I became more comfortable with this form of play pretend. He can often be found jumping out from his bedroom door, "defending" the hallway, and running around going "pew pew" at random objects. Sometimes he will pretend to shoot us, and I tell him that we don't shoot people, but he's not even 3 yet and he's still learning. We still don't allow play guns in the house but he will turn anything and everything into a gun. Last night when I picked him up from daycare, I was confronted by a new daycare teacher who seemed very concerned about his gun play. She told me that he's been acting out lately, and that when she asked him to sit down, he pretended to shoot her. She seemed very disturbed by this and it made me feel like we might have a problem on our hands. She told me in her beautiful English accent that he's "been a bit tricky" and asked me if he acted like this at home. I felt like I was being scolded by Super Nanny herself. "Local man gunned down 5, used to make guns out of blocks as a child. His mother should have seen the warning signs...story coming up at 11"
I turned to our local mom group again for advice. How do we teach our toddlers about the dangers of guns but still allow them to play pretend? Many mom's and daycare teachers I've spoken to have confirmed that no matter how much you try to keep guns out of the house, they're going to use random objects around the house. So far Mason has used his hand held toy vacuum, food, Mega Bloks, sticks, his fingers (which he also uses as a robot) etc as a gun. It doesn't mean we're doing anything wrong, it's just part of pretend play for them, and some people even say it's good for their development. We live in Canada, where guns are basically only used for hunting and policing. My son isn't going to grow up in a world where people are walking around stores packing heat (at least not legally), so it's important for him to know that guns are only for people who have the proper designation to use them. If you live in a country that allows you to carry firearms, you'll want to teach them the same thing, just modified for your own laws. My biggest struggle so far has been teaching my son not to pretend shoot at people. He falls over laughing when my mom pretends to fall down dead. I'm just going to keep reinforcing and reminding him that we don't shoot at people. This is a BIG one to remember. Always ask your friends, family and your child's friends parents if they have firearms in the house. If they do, ask them how they store it and who has access to it. Also, don't be afraid to re-ask each time your child goes there. Some people may have purchased a new gun and not told you about it. My father is a police officer, so asking where he keeps his gun, pepper spray etc is really important. One of the moms I spoke with told me about a song they do that goes "STOP! Don't touch, Leave the area, Find an adult" and I thought that was an amazing idea. I looked up that phrase online and came across this amazingly informative PDF about gun safety. I think a great option would be to print out some safety information and have it laminated for you to go over with them. You could print out that song, so they can see the words as you're singing it, along with any other safety information you want to include. I literally print and laminate everything at Staples, so this would be a really fun project to do sometime. Let me know in the comments if your kids also play pretend guns, and if you have any other safety tips! Some great ideas here! Because guns aren't always visible, it's sometimes easy to forget they exist. Sound advice! We tried so hard to avoid weapons being a part of their games and everyday playing nad failed miserably! 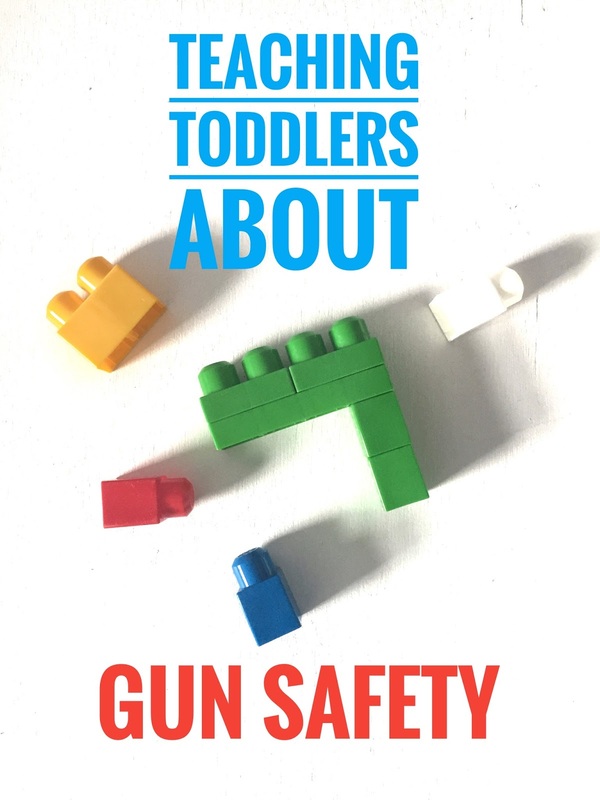 Important topic - pretend gun play is inevitable, no matter how much we try to discourage it. We don't keep weapons in our home, but can see this being a great resource for those that do. This is a very important thing to discuss with toddlers. I think sometimes people forget how easy it is for accidents to happen. Knowledge is key! Even for toddlers. Great post! It's still important to teach them what to do if they come across one in someone else's house, even if we will never have one here ourselves. Some people around here hunt and have shot guns in their homes, so I want my son to know that we don't touch them and to tell an adult if one of his friends tries to show him one someday. If he ever wants to own one himself, we have to go through hunter/fire arm safety courses here, so that's where he would learn the safety aspects of how to use one. It's a lot more difficult to buy a gun in Canada than it is in the States.